*Purex provided me with Dial coupons in exchange for sharing the Dial sweepstakes and to hold the giveaway. However, all opinions are 100% mine. Now that my kids are preschoolers, they need something a little stronger than baby wash to get the smell off of them. I had no idea before I became a mother that little kids could get so funky in 24 hours. Now I'm 3 kids wiser about how dirty kids get in between their daily baths. We tried the Dial Naturals Tangerine & Guava Moisturizing Body Wash on the kiddos and the Cranberry and Antioxidant Perls for myself. Wait, you think we're dirty? While the kids don't care what their body wash smell like, I do! And while I liked both scents, I prefer the Cranberry. I liked that the body washes were moisturizing and that they don't have an overpowering smell. I also liked that the Naturals line is 94% naturally derived and hypoallergenic, with no artificial dyes. I try to use natural products whenever possible. Dial is running a great sweepstakes on their site. They are giving away $65,000 in gold to one lucky winner to commemorate their 65 year anniversary. Although between you and me, I hope I'm the lucky winner. 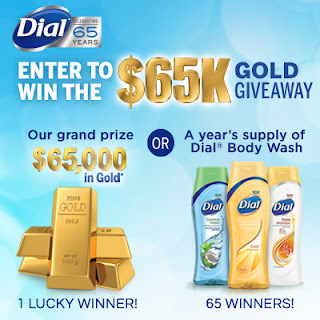 Dial is also giving away a year's supply of body wash to one winner everyday between June 16th and August 19th 2013. You can enter daily to win through Dial's Facebook Page. Want to try Dial's body wash for free? I am giving away 3 coupons to purchase a bottle of Dial body wash. This contest is open to US residents, only entries on Rafflecopter will count.